Pirates are a constant popular theme used at parties for both boys and girls. Younger children especially can really enjoy playing Halloween pirate party games and activities that are fun and entertaining to join in with. 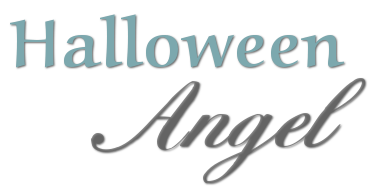 Whether you have visions of a Jake and the Neverland, Captain Jack Sparrow or more of a darker, spooky style celebration, you’ll find plenty of ideas and inspiration here for your event. All you need for this themed occasion is to add in a little bit of creativity. Most of the pirate games and activities listed and explained here for you can be played indoors or outdoors depending on the weather. They are all fun and inexpensive to do. These Halloween pirate party games do not need to involve spending lots of money. It can be very cheap for the majority of activities. Especially if you’re willing to print things out and decorate items yourself in preparation for a brilliant time to be had by all. Ship ahoy! Pirates are well known for making their prisoners walk the plank, off the ship and into the sea. What a cute game idea this will make. You’ll need a long plank of sturdy wood and several bricks to hold this piece of wood raised up slightly over grass. Soft grass or any other soft landing such as sand or play-mats will make this an easy and fun game for kids. With smaller and younger children, just getting across the plank without falling over can be hard enough and you can give them an eye patch to wear in order to make it just a little bit harder to get to the end. With older children playing this, you can make things a little harder. Make use of the kids who are watching by giving them a spray bottle of water or water gun soakers to aim at whoever is walking the plank, just like the mist from the ocean waves or choppy seas! Do make sure the kids have appropriate clothing or a spare change of clothes before getting them wet though. Award points for getting all the way across and deduct points for falling or feet touching the ground when they should be on the plank. Alternatively, award prizes instead of points for completing the challenge. If safety is an issue for younger kids playing the game, you can have them crawl the plank instead of walking so long as the plank is smooth and has no risk of splinters. A game of musical chairs using colored hula hoops as islands will be a time of excitement where kids can really burn off some energy. You will need quite a bit of space for this game so either a big room or a large area in a yard. The little kids will have to walk around the island hula hoops until the music is paused and then they will have to quickly jump into an empty island. For this game to work, there should always be 1 less island or hula hoop for the number of children playing the game. The child who doesn’t manage to get into an empty island is out of the game. Then take away another hula hoop island and restart the music. Keep playing this until you have one child left who is the winner. Treasure chest throw is a game where each child is given 5-8 ping pong balls or plastic gold coins. Each child will try and toss as many balls into a small ‘Treasure Chest’ box from a set distance, and the one who manages to throw the most balls in, wins. For the balls, you could also use the cannonballs I describe how to make in the Relay Race further down this page. That way you save on time because you are using the same items for more than one activity. You can buy a treasure chest or make one yourself using a cardboard box, so this game can be very inexpensive to play. Perhaps you could plant some ‘treasure’ in the chest that the winner gets to keep. It can be good to include some inexpensive prizes for the ones who don’t win too. A treasure chest can be used for several games during the course of the party. You can use it for target and throwing games and also in fun treasure hunts by hiding the big treasure loot inside. One birthday that my daughter attended involved the kids decorating their own treasure chests with pens, plastic gems and stickers. They then used their own chests to store in any loot won throughout the event and took them home at the end of the day. My daughter still has her chest, she loves it. Cannonball Toss is a rename of the old favorite Hot Potato game. You can paint a lightweight throwing ball, such as a tennis ball, black and then use white paint to add one of the following words like explosive, explosion or boom! Alternatively simply paint on some white stars and exploding shapes. Gather all the kids at the party into a circle and get them to throw the cannonball to each other while you play some music. Preferably use some pirate-y themed music. The child left with the cannonball when you pause the music is out of the game. Keep on playing the game until there is a clear winner left. X marks the spot is a themed way of playing the favorite party game, Pin the Tail on the Donkey. On a poster board you can draw out a map or alternatively buy a pirate map online and in the center of the map draw a large X. 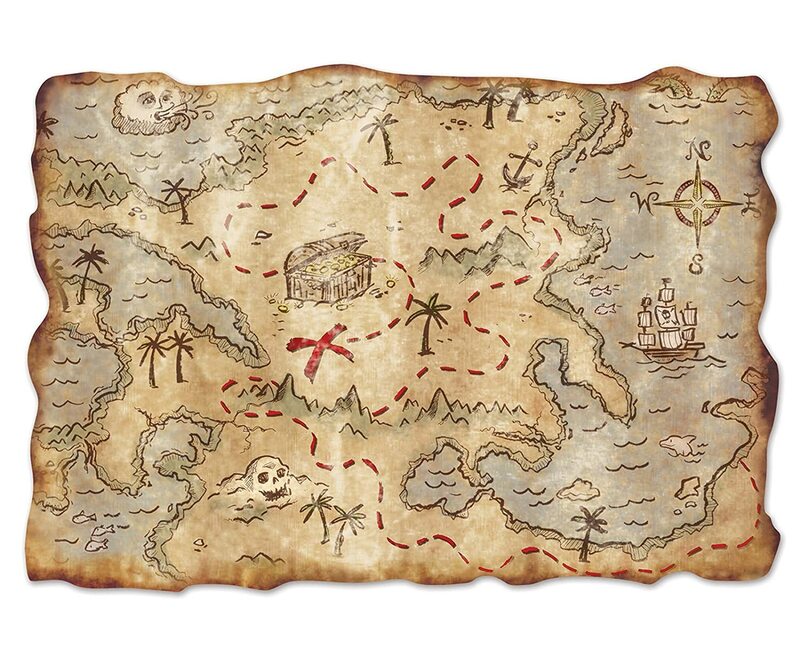 Have the children blindfolded one at a time so they can try and place a treasure chest sticker or Jolly Roger flag sticker onto the X on the map. The winner of the game is the one who lands on or closest to the X. This is a good indoor game to play because it doesn’t require much space, just a wall or place to hang the map up. You can also play it outdoors if the weather is dry. A large plastic treasure map can have multiple uses. You can use it as a large piece of themed wall decor for the party and for a really tricky game of X Marks the Spot. A plastic treasure map, it should last a little longer than a paper version and can also withstand having drinks and water splashed on it too. 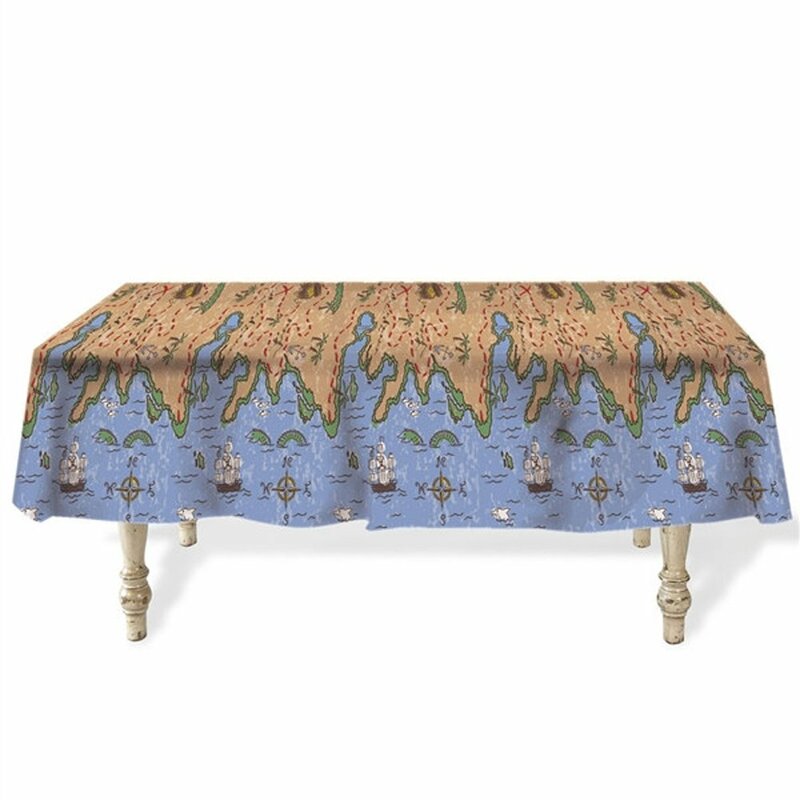 You could also drape it over a large table in order to play the X Marks the Spot game. A really fun game is a Cannonball Relay, a basic egg and spoon type game, which can be played with teams of kids. Use painted black golf balls as make believe cannonballs that sit in a spoon while the children run to their waiting teammate to exchange their cannonball without dropping it. The team to finish the relay first wins. Inexpensive packs of golf balls are great as pretend cannonballs for your pirate party. You can spray paint them black or try using a mix of black paint and white liquid glue to cover them. These could be used for other throwing and target games as well as the relay race. 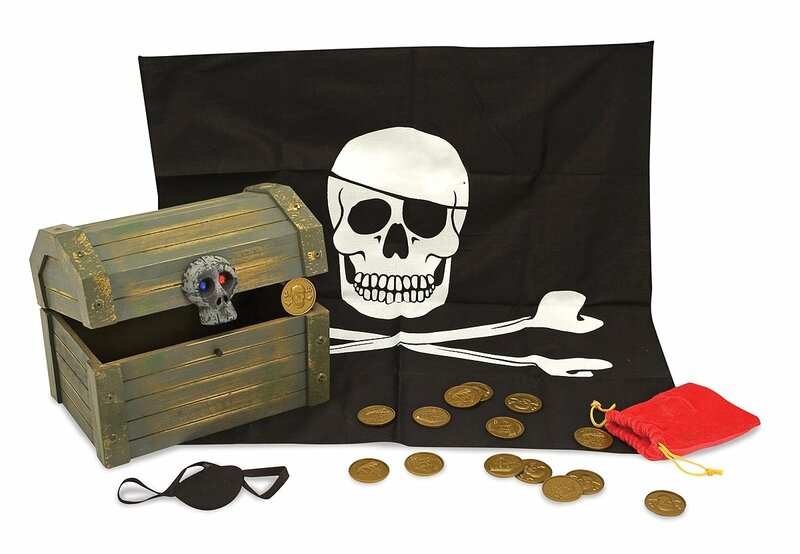 All pirates are known to have a buried treasure and a treasure hunt game is ideal to keep party goers busy for a while, perhaps while some adults prepare food. 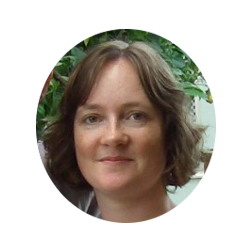 You can use clues so that the kids can find the treasure and these clues could be photos of hiding locations which makes it a little easier for smaller and younger children, or clever riddles for older kids. 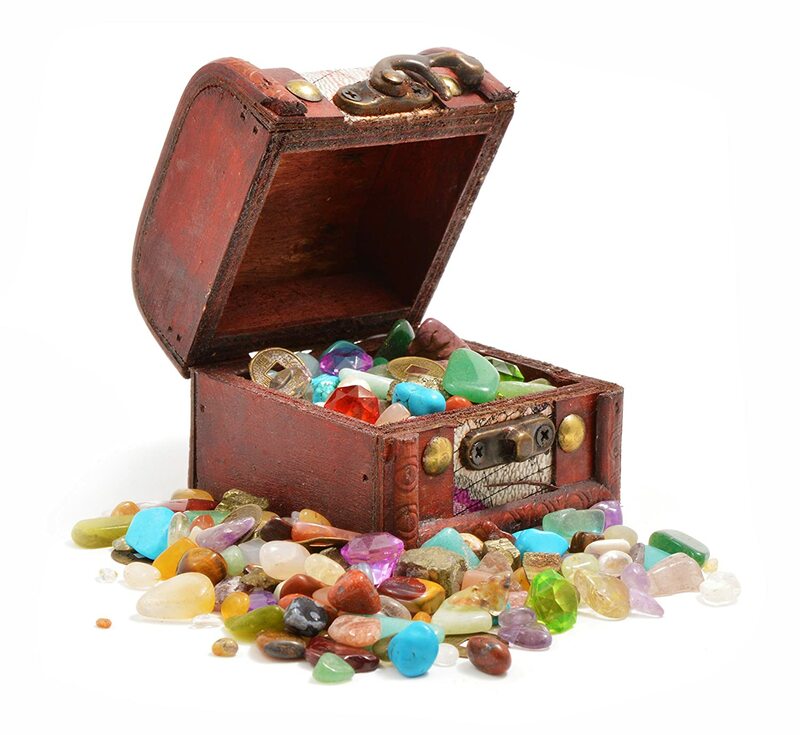 Treasure hunts can be to find lots of small loot which is ideal for young ones or using clues to find a bigger piece of treasure that all the kids get to enjoy at the end. If you have a large sand pit, you could hide lots of wrapped ‘treasure’ in the dry sand for small children to find as young kids normally enjoy playing in sand. This birthday would not be the same without some spyglass telescopes for your young buccaneers. Guests can make their own spyglass using a toilet paper roll and a paper cup. Kids need to paint the cup and roll whatever color they like and let them dry (perhaps while they play another game) before using the two items to make their very own telescope that they can take home with them. See how to make the telescopes here.